When the town’s famous billionaire Verdal Ward mysteriously disappears, everyone in the town wants his fortune. But, Cassie and Dodge, her dog, think this mysterious disappearance sounds fishy. Together, Dodge and Cassie uncover a trail of clue that leads to a more complicated case then they originally thought. My favorite part was when Cassie was trying to calm hugo down because he was barking for so long he started getting hoarse. Cassie calmed him down and started playing with him. It made me feel happy because he can let his voice heal. 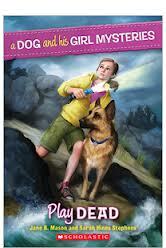 If you like mysteries and dogs, you’ll love this book! This book’s genre is mystery. This book’s story line is action-oriented. This book left me feeling surprised. On a scale of 1-5, I give this book a 5! This review was written and submitted by 5ht grader Annie.